From the silent movie 'Raja Harishchandra' Indian cinema has indeed come a long and large way. The Indian film industry is largely represented by 'Bollywood' or the Hindi film industry though storytelling excellence and technical excellence is far more advanced in the southern film industries specifically Tamil Cinema. I am getting over my writers block with this post reviewing two movies I watched this weekend at the movies. Overall my movie watching has dipped a little due to various reasons but meeting new people with a passion for watching movies has sparked my interest again ! I did catch up on a few DVDs like Zero Dark Thirty, Chinatown and added a few movies to my collection (you can see my entire list here). 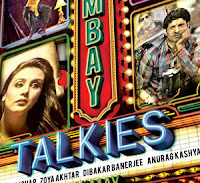 The two movies I share my views on are 'Bombay Talkies' and 'Shootout at Wadala'. The 2 movies are a great comparison of the 2 kinds of cinema made after 100 years. One celebrates that the essence of cinema is storytelling and the other celebrates the power of visualisation and all the frills one gets in the movies. This movie is meant to be a celebration of the 100 years of Indian cinema. The format itself of having different segments directed by different directors is nothing new in Hindi cinema but the kind of directors directing the 4 segments is quite a surprising mix. Karan Johar, Dibankar Banerjee, Zoya Akthar and Anurag Kashyap. One could have imagined Dibankar and Anurag collaborating but Karan ? Or is Anurag moving over to the dark side ? The segments are supposed to have a common theme of cinema but I found the first segment by Karan slightly weak on that where the old cinema music just played a secondary theme and connect to the story. The tale of a married couple and a homosexual is possibly a story Karan would never have been bold enough to make without the large budgets, flash and bang of romance, but ends up delivering a classy piece. If you forget that it is meant to celebrate cinema this segment is just some good bold film making. Stars Rani Mukherjee Randeep Hooda and Saqib Saleem. The second segment directed by Dibankar Banerejee is my favourite. Starring Nawazuddin Siddiqui the tale is about a young man who lands up on a film set and has a very strong emotional undercurrent to the plot. Nawazuddin is a natural and the script is perfect to highlight that. This segment is a must watch for its sheer brilliance through simplicity. The tale of a father, his background in acting, his difficult circumstances, his inner voice and finally his acting that matters most needs to be seen. Almost everybody watches the movies and wants to grow up to be whom they see on screen. Zoya Akthar's segment deals with the dreams of a boy who wants to grow up and be like his favourite star. While I did not mention this segment as being among my favourites because I did not find the story interesting enough, the depiction of the parental pressures on a young child is quite realistically and more importantly, subtly done. the performances are brilliant and is what lifts this tale. The last segment is directed by Anurag Kashyap and obviously brings out the passion for cinema through the tale of one man's desperation to meet Amitabh Bachchan. Interestingly the main character himself is not shown as a crazy obsessed fan but as a man on a mission. Around this character's journey one gets to see the fandom that surrounds one of the best actors of our country. Be it the 'darshans' given by him to fans, the look-alikes making money or the sheer variety of fans trying to get a glimpse of him. Simple tale, brilliantly performed, tight direction makes this segment a gem and represents all the fans that make film stars who they are and the status they enjoy through films. Overall, the movie is a must watch for all the great performances, simple stories, great directing and the experimentation. Come on, 100 years of cinema in India deserves 2 hours and a few bucks in the multiplex. Directed by Reema Kagti, stars Aamir Khan(Surjan), Rani Mukherji(Roshni), Kareena Kapoor(Rosie) and Nawazuddin Siddiqui(Temur). Movie opens with a big-bang accident which involves a car falling into the Arabian Sea in the middle of the night. Search operations reveal an upcoming famous movie star Armaan Kapoor (Vivaan Bathena). Surjan is entrusted the investigation of the accident, which kick starts the movie. Surjan and Roshni move into a new neighbourhood and Roshni is welcomes by nosy neighbor Frenny(Shernaz Patel). There is not much conversation between the couple and Roshni is spending a good amount of her time with the psychiatrist, to overcome a major tragedy in their life, for which Surjan holds himself responsible. Surjan is a workaholic and spends all day and night on the investigation. This leads him to meeting Rosie,a call girl and she enchants him, giving him certain subtle clues about the accident. He spends a considerable amount of time in the red-light areas since that’s where the common thread of the accident lies. Temur on the side wants to make a quick buck thinking he knows the cause of the accident. Multiple encounters later, he seeks her to get his peace of mind and puts together the pieces of the puzzle that leads him to the reason behind the accident, and eventually closes the case.